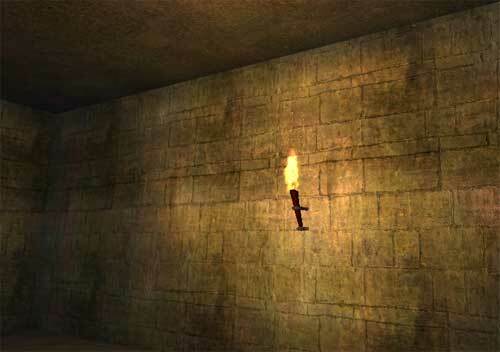 I need a wall torch...something like this: http://udn.epicgames.com/Two/rsrc/Two/ExampleMapsAdvLighting/wavering_torch.jpg but without the fire effect (i'll use a simple particle effect to do this). Any takers? I love this collaborative stuff! Sure, I'll do you a wall torch - actually, if I do a torch and a separate bracket maybe the player could grab the torch and use it? That'd be cool! Let me know either way, I can get it done by tomorrow night. Looks like I got beat to it. Dungeon is looking good. The colors might be a little much, depending on the game style. I'm sure you'll need more help populating the dungeons with artifacts and monsters eventually. I think it might look a little nicer if the floor and ceiling were using larger stones, of course, I'm sure you're working out the mapping right now, which is looking right on. Thanks for the suggestion...i'll try how it looks with a different floor/ceiling. Luckily, floor and ceiling are separate tiles anyway, so that's a an easy change. The lighting is just for testing...it's not going to look like this. OK, my first go at the torch is here. 192 polys all in - is that too many? I can reduce that to maybe 100 - it depends on how close you want to look at it. I used the bow as a guide to size so the scale should be approximately right. Yes...it looks cool. 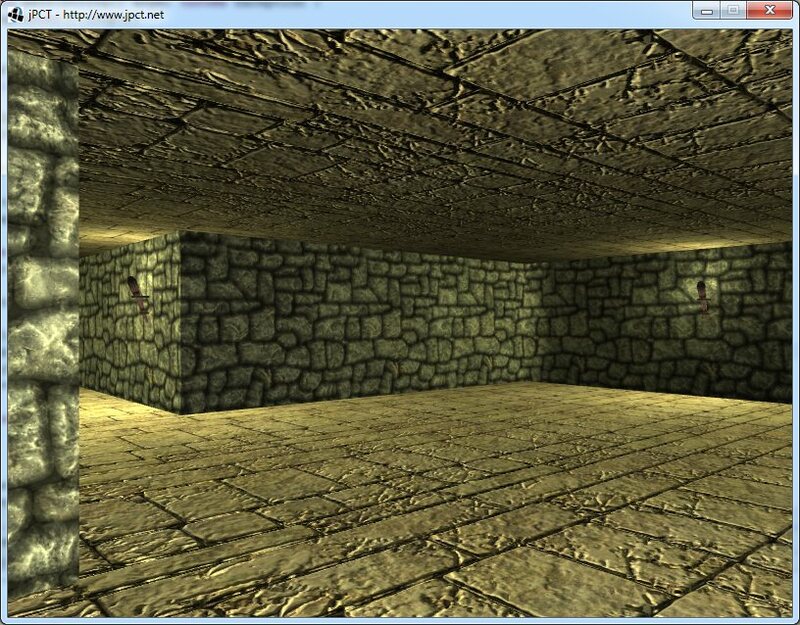 I'll try to add it to the dungeon within the next days. Many thanks. 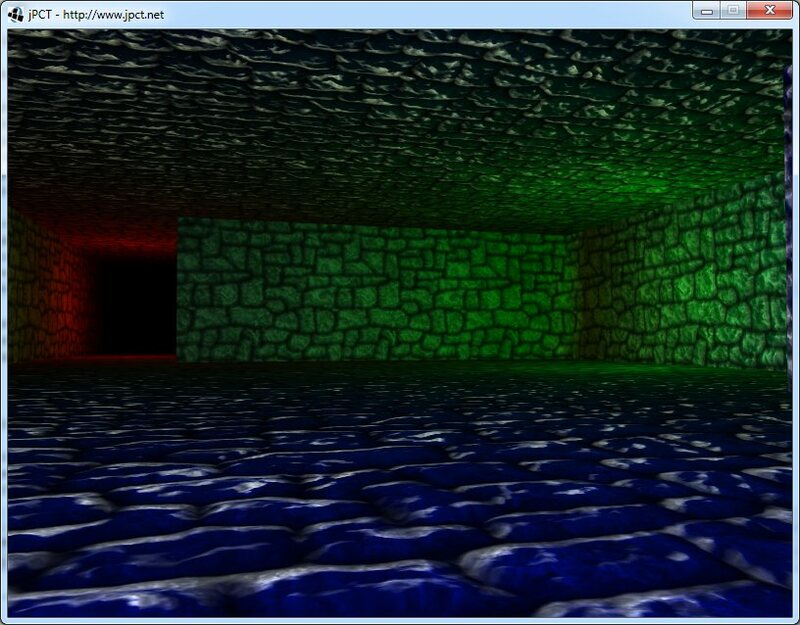 I've changed floor/ceiling to another texture and got rid of the LSD colors...any better now? 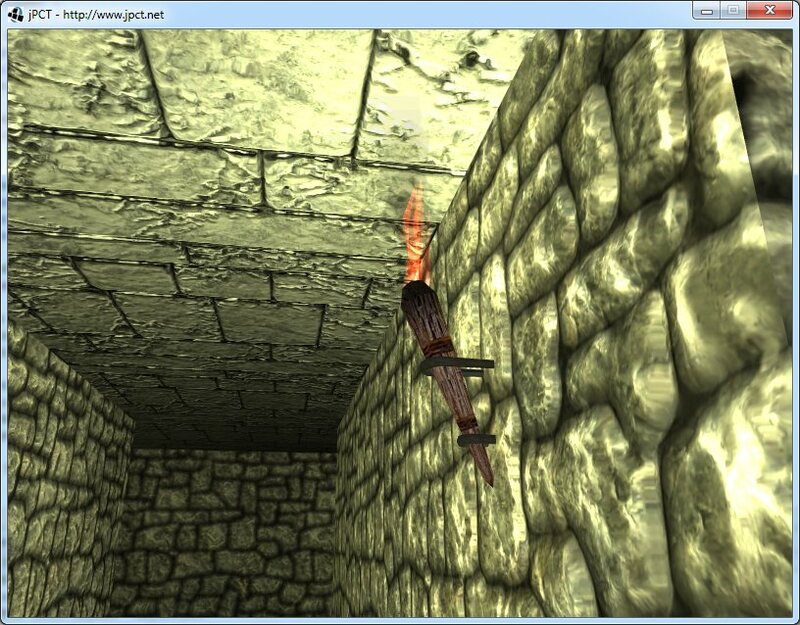 Edit: Replaced the image with one that already uses the torch model....but no particle effects yet. I like it better also. The two textures and different size stones give it a more interesting look. Another thing you might think about is pillars and joists in large areas. That's just a suggestion as it looks fine. The ground and ceiling is a bit too golden and bright for my tastes but definitely better than before. NP, it was fun making it - I don't mind a little light work now and again! Me too. I expect something around 20-25fps on the Nexus S.
The torch is working fine on the desktop. The next thing is to merge all this with the terrain rendering and port it to the phone to see if its feasible.